Is Manulife Financial Corporation (MFC) A Good Stock To Buy Now? Is Manulife Financial Corporation (NYSE:MFC) a good investment now? The best stock pickers are in a bearish mood. The number of long hedge fund bets went down by 1 recently. Our calculations also showed that MFC isn’t among the 30 most popular stocks among hedge funds. We’re going to review the key hedge fund action regarding Manulife Financial Corporation (NYSE:MFC). What have hedge funds been doing with Manulife Financial Corporation (NYSE:MFC)? At Q4’s end, a total of 20 of the hedge funds tracked by Insider Monkey were bullish on this stock, a change of -5% from the second quarter of 2018. 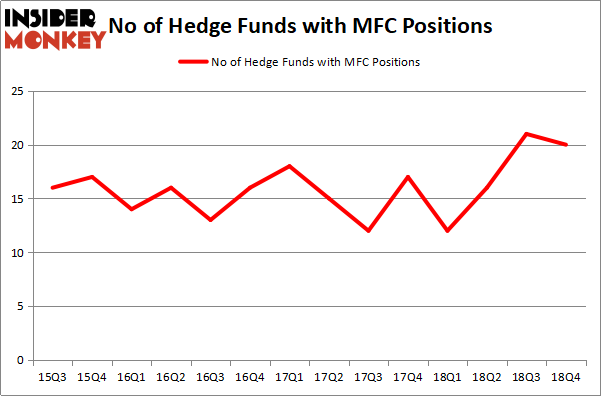 The graph below displays the number of hedge funds with bullish position in MFC over the last 14 quarters. With hedge funds’ capital changing hands, there exists a few key hedge fund managers who were adding to their holdings meaningfully (or already accumulated large positions). Of the funds tracked by Insider Monkey, Ken Griffin’s Citadel Investment Group has the largest position in Manulife Financial Corporation (NYSE:MFC), worth close to $92.8 million, accounting for 0.1% of its total 13F portfolio. The second largest stake is held by Jim Simons of Renaissance Technologies, with a $51.9 million position; 0.1% of its 13F portfolio is allocated to the company. 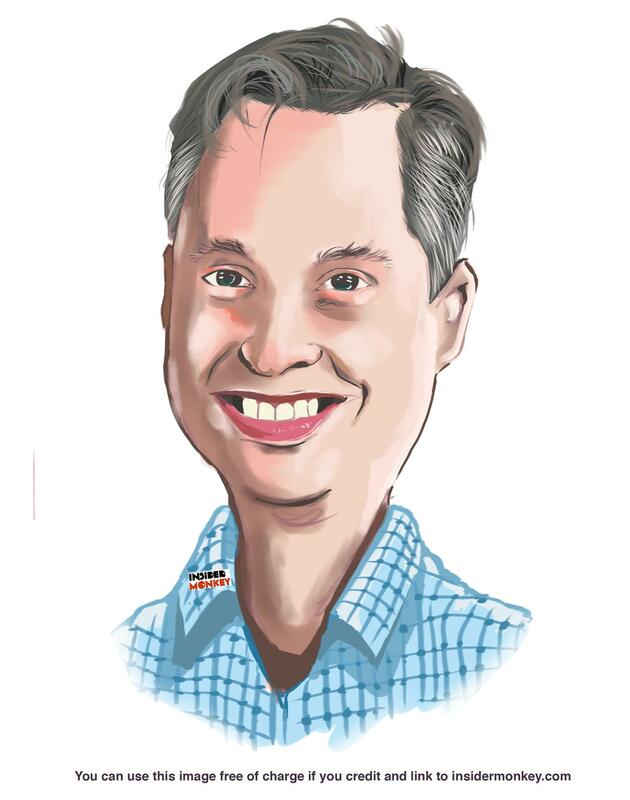 Some other professional money managers with similar optimism contain Peter Rathjens, Bruce Clarke and John Campbell’s Arrowstreet Capital, Cliff Asness’s AQR Capital Management and John Overdeck and David Siegel’s Two Sigma Advisors. Because Manulife Financial Corporation (NYSE:MFC) has experienced a decline in interest from the aggregate hedge fund industry, it’s easy to see that there exists a select few hedge funds that slashed their entire stakes last quarter. It’s worth mentioning that Dmitry Balyasny’s Balyasny Asset Management sold off the largest investment of all the hedgies tracked by Insider Monkey, worth close to $24 million in stock, and Daniel Lascano’s Lomas Capital Management was right behind this move, as the fund said goodbye to about $18 million worth. These transactions are intriguing to say the least, as aggregate hedge fund interest was cut by 1 funds last quarter. Let’s now take a look at hedge fund activity in other stocks – not necessarily in the same industry as Manulife Financial Corporation (NYSE:MFC) but similarly valued. We will take a look at Chunghwa Telecom Co., Ltd (NYSE:CHT), Credit Suisse Group AG (NYSE:CS), O’Reilly Automotive Inc (NASDAQ:ORLY), and Roper Industries, Inc. (NYSE:ROP). All of these stocks’ market caps resemble MFC’s market cap. As you can see these stocks had an average of 22.5 hedge funds with bullish positions and the average amount invested in these stocks was $727 million. That figure was $286 million in MFC’s case. O’Reilly Automotive Inc (NASDAQ:ORLY) is the most popular stock in this table. On the other hand Chunghwa Telecom Co., Ltd (NYSE:CHT) is the least popular one with only 2 bullish hedge fund positions. Manulife Financial Corporation (NYSE:MFC) is not the least popular stock in this group but hedge fund interest is still below average. Our calculations showed that top 15 most popular stocks among hedge funds returned 19.7% through March 15th and outperformed the S&P 500 ETF (SPY) by 6.6 percentage points. Hedge funds were also right about betting on MFC as the stock returned 20.8% and outperformed the market as well.